A new tyre retailer developed by one of Britain's biggest tyre distributors guarantees that its prices will be "pounds cheaper" than from anyone else in the UK. Tyre Giant is a breakthrough online tyre retailer developed by Bond International, one of the biggest tyre distributors in the UK, which has a consistent stock of half-a-million tyres in its five UK warehouses, and a transport network of 120 vans, which are on the road at all times delivering 11,000 tyres per day. Instead of being given questionable quotes for new tyres in the middle of a mechanic’s forecourt, Tyre Giant now offers a comfortable way to find the best tyres for any car via the Tyre Giant website. 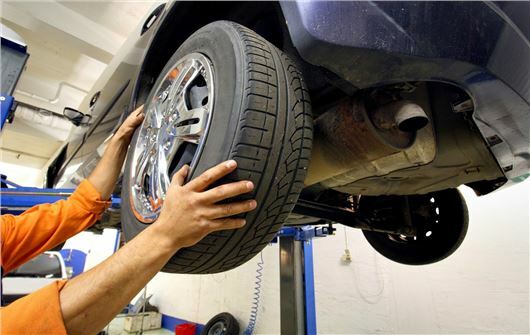 In a relaxed environment, without the pressure of a mechanic trying to push through a sale, you can browse through a vast range of tyres online, and select the perfect tyre for your car and price range, before booking a tyre-fitting appointment at your referred centre – often with next-day appointments available. Working alongside a network of 2,600 dedicated local and national tyre fitters, Tyre Giant has ensured complete mainland UK coverage and the vast majority of the UK population are within just three miles of a Tyre Giant -affiliated fitter. Alternatively, you can choose to have their tyres delivered to your home or workplace if you want to fit the tyres yourself or organise your own tyre fitting appointment. This option saves £14 off the cost of each tyre. You have the choice of three ranges of tyres: budget, mid-range and premium tyres, providing a full price range to suit everyone’s needs. Tyre Giant’s value offering means customers can buy a full set of budget tyres for less than the price of one premium tyre; helping your money stretch much further than any other retailer. Tyre Giant has re-launched its website to guarantee the lowest-priced tyres for UK cars anywhere online, along with extreme ease of navigation and the ability to find a tyre of choice simply and quickly. Tyre Giant guarantees that it will match any price of a stocked tyre anywhere online, and give the customer 10% cashback of the price of the cheaper tyre’s cost, helping them beat the ever-increasing cost of keeping cars on the road. • Tyre Brand – some people may have a favourite brand of tyre, which is why Tyre Giant gives users the option to search by their favourite brand, making it easier to find the tyre that they want, in the shortest time possible. To test out Tyre Giant’s features, and see how much you could save, go to www.tyregiant.com. I used their subsidiary www.tyresavings.com and saved a fortune on tyres. Only discovered them via a Halfords Autocentre who recommended I take look, their prices (for fully fitted) could not be beaten by any local fitter (including an indy! ).